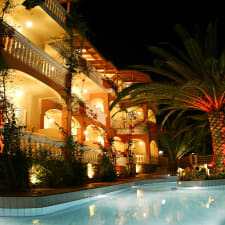 Hotel Zante Calinica Planos is a 3-star, pet-friendly property situated along the water in Zakynthos area of Tsilivi. The property features two outdoor pools, a restaurant, a bar and a rooftop lounging area. Guest rooms feature a balcony, air conditioning, a television with cable and satellite channels, coffee and tea facilities, a hair dryer, premium bedding, complimentary toiletries, a safe and a kitchenette with a refrigerator. Services and amenities offered at the hotel include room service, a tour desk, a garden, concierge service, bicycle rental, luggage storage, complimentary Wi-Fi, airport shuttle and BBQ facilities. A buffet breakfast is served each morning at the hotel and a coffee shop and poolside bar are also on-site. Hotel Zante Calinica Planos is located close to a number of attractions including Tsilivi Beach, Byzantine Museum of Zakinthos, Museum of Solomos and Kalvos, Tsilivi Waterpark, Dimokratias Square and Solomos Sqaure. Mountain biking and hiking are popular activities in the area. Guests reported that their room balconies overlooked a spectacular view of Tsilivi Bay and the surrounding area. The swimming pool is large, beautiful and well-maintained. Guests reported that it is cleaned frequently, there are lots of trees and plants surrounding the pool, it's safe and there are plenty of sun loungers. Some guests reported that it is very hard to relax around the hotel because of all the noise from screaming children who run up and down the corridors and non-stop traffic on the street. The guest rooms at Zante Calinica are small and untidy. Guests also reported that the Wi-Fi doesn't work in the rooms, the kitchen is small with hardly any dishes or utensils, the beds are uncomfortable and some amenities are missing. Due to a lack of signage and a failure to provide proper directions, guests reported that this hotel is quite hard to find. It is also not located in as central of an area as guests are led to believe.